This entry was posted in Clubs, Events, Students and tagged auburn university, Investment Club, Student Investment Fund Competition on February 27, 2013 by Wire Eagle. AUBURN UNIVERSITY – A group of Auburn students is learning the value of investing through a friendly competition with other universities. The Auburn University Investment Club is competing in the Student Investment Fund Competition sponsored by Sterne Agee, a Birmingham-based investment bank which distributed $50,000 to each of the four schools in the Southeast participating in the equity portfolio management challenge. The schools also include the University of Alabama, the University of Georgia and the University of Mississippi. The winner will collect the full monetary value of its return while the other schools will receive half of their return; all prize money won by Auburn will go to the College of Business. 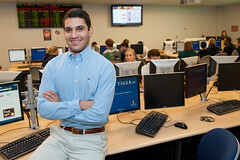 Auburn’s Investment Club is led by president and CEO Juan Castano, a senior finance student, and is comprised of 25 students from across campus. “The investment club is one of the College of Business’ best kept secrets, in my own opinion,” said Castano. Most members are from the College of Business and are working toward degrees in finance. However, the club is open to all students and has recently included engineering and math majors. “Having served as president for the last four years, I am both proud and mesmerized by the natural expansion of our members and the growth of sophistication behind our investment strategies,” Castano said. The investment competition got under way in October and will end in April. At this point in the competition, Auburn has generated a 7 percent return, which is close to its goal of 8 percent; the club finished second last year and hopes to climb to the top spot this year, Castano said. Each year the competition develops in a different way, and the club invests in a variety of companies. A winning investment in the past has been Apple, but it has become a stock that is providing low returns, Castano said. Michael Kors, CBS and Yahoo are currently showing the strongest returns and are large contributors to the club’s current success. The competition is governed by a set of rules put in place by Sterne Agee upon releasing the funds to each school. The money can only be invested in stocks. Only 10 percent of the $50,000 can be invested in a single company, which encourages each school to diversify its stock portfolio. The Auburn University Investment Club has been a part of campus activities for over a decade and has helped students by providing real-world investment experience. The club meets on Tuesdays at 5 p.m. in 005 Lowder Business Building and is always looking for new members. More information is available by contacting Castano at jpc0014@auburn.edu.